Well adapted to many soil types. Usually grows in wet areas along streams but can tolerate sandy or rocky areas. Excellent for wetland reclamation purposes. Has bank stabilization and erosion control abilities. 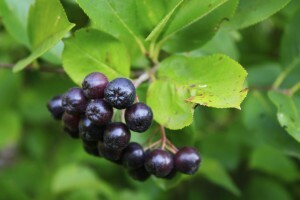 Attracts pollinators and birds enjoy foraging on berries. Salt tolerant and can handle some urban conditions. Edible berries can be used for jams, jellies, baking and just plain enjoying!